Google published an interesting post over on their Politics & Elections blog. The author created an infographic is both informative and pretty. Although, in full disclosure, Google is attempting to sell their services to political campaigns. Nonetheless, the infographic is hella interesting. 1/3 of people who have seen a campaign ad on YouTube, have not seen the ad on TV. 80% of smartphone users actively use their device while watching television. 83% of mobile voters are registered voters. Tablet ownership has doubled since last December. 68% of voters use the Internet as their primary source of information on political candidates and issues. There’s a not-so-implicit story here about media access and the mediums which we receive political information. Compared to television, internet-based mediums offer dynamic access to a wide amount of information. In the past decade, we have revised our understanding of political communication in light of the Internet age. It’s no longer newspapers, radio, and television. Digital content is spreading and this infographic shows that political communication is still evolving. Even since the last presidential election, the dissemination of political information has drastically changed. 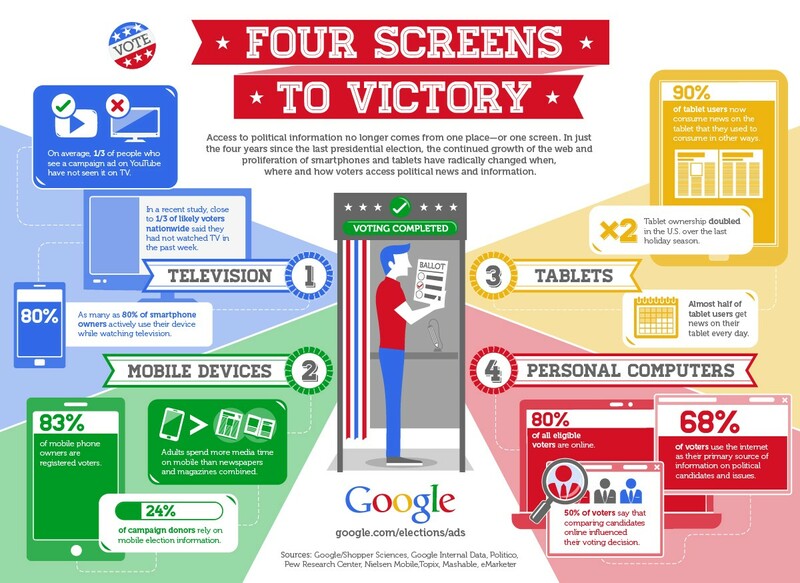 Campaigns now have to consider four digital mediums: television, computers, phones, and tablets. The advancement of mobile and tablet technologies has put political information in the hands of many more people. In addition, people have access to this information with increased frequency. Now, political campaigns are some of the slowest adapters of technology. However, these four mediums will undoubtedly change the political landscape in ways we can’t yet see. Google has the right idea. They’re trying to be pioneers of this technology, but they’re trying to do so from behind the scenes. As of yet, little has been done to organize political information to the benefit of the American voter. The primary focus has been on using emerging technologies to gain votes. But eventually, with the increased permanence of this technology, this focus will shift. The question is in what ways will this shift benefit the average joe?